Letters home are an integral part of understanding the stories of missionary workers abroad. As such, this project consists of three transcribed letters, all of which describe aspects of Susan Rowena Bird's missionary experience. The first is a letter Bird wrote to her mother as she was traveling through Japan in the fall of 1898, on her way to work in China for a second time. The letter includes descriptions of the places she visited, her travel companions, and their encounters with other missionaries doing work in Japan. The second letter, written by Bird to her mother in January 1899, was sent from Taigu, a missionary compound where Bird lived for the majority of her time in China. The letter details her activities in Taigu and gives the reader a picture of events in Bird's daily life abroad. The third transcribed letter is from Kung Hsiang-hsi one of Susan Rowena Bird's closest converts, to Bird's mother sent almost a year after Bird's death in Taigu. The letter briefly discusses the violent circumstances of her death and gives a moving example of the significance of her relationship with this boy during her time as a missionary. As a missionary, Susan Rowena Bird followed the legacy of many outspoken Christian women from the first wave of American feminism. Like others, Bird felt a moral calling to convert others and devoted her time to Christian mission work. She would have read with fondness and familiarity the following words of feminist Maria Stewart: "From the moment I experienced the change, I felt a strong desire, with the help and assistance of God, to devote the remainder of my days to piety of virtue, and now possess that spirit of independence, that, were I called upon, I would willingly sacrifice my life for the cause of God and my brethren. "2 During Bird's life and missionary career, Christianity was widely accepted as an appropriate and respectable sphere for women to encompass. Although her missionary work may not have been radical, Bird's religious calling nevertheless led her down an unconventional path as a single woman living abroad. She embodied the challenge of "radical respectability," using conservative values to authorize her unusual personal behavior. Addams believed that doing work for others was the most important role a woman could fill, and Bird likely would have agreed. Whether in Chicago or China, women with this worldview devoted their time and energy to a range of social issues, such as education and substance abuse, each of which Bird worked to improve during her time as a missionary. Both Jane Addams and Susan Rowena Bird held the conviction that a group of people - largely made up of women - could join together to enact what they saw as necessary social reform. 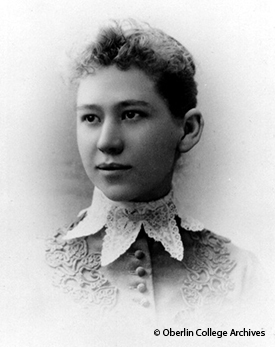 "Susan Rowena Bird (1865-1900) Biography," Oberlin College Archives.. http://www.oberlin.edu/archive/holdings/finding/RG30/SG351/biography.html. Maria Stewart, "Religion and the Pure Principles of Morality, The Sure Foundation on Which We Must Build," Boston (Massachusetts) Friends of Freedom and Virtue. (1835) Excerpted from Blackboard HIST 213, p. 1. Jane Addams, "Bread Givers," Rockford (Illinois) Daily Register (21 April 1880), Reprinted in Jane Addams, A Centennial Reader (Macmillan, 1960), p. 104. Allison Sneider, Suffragists in an Imperial Age (New York: Oxford University Press, 2008), 113.